WASHINGTON, D.C. -- The world is a slightly more negative place than it was even a few years ago, according to Gallup's Negative Experience Index. The index, a measure of people's experiences of stress, anger, sadness, physical pain, and worry, has crept upward since 2007. Gallup measured negative emotions in 138 countries in 2013 by asking people whether they experienced a lot of stress, sadness, anger, physical pain, and worry the previous day. Gallup compiles the "yes" results into a Negative Experience Index score for each country. Looking at the individual components, one in five worldwide say they experienced anger (19%) and sadness (20%), more than one in four experienced physical pain (27%), and one in three experienced stress (33%) and worry (34%). Findings for all countries can be found on page 2. Four of the top five countries with the highest Negative Experience Index scores are located in the Middle East. Iraq has made this undistinguished list every time it has been included in the Gallup World Poll and has led the world twice. Iran and the Palestinian Territories have at least made the top 15 every year. Syria's scores have increased dramatically since the start of its civil war. It is the only country in the world whose Negative Experience Index score exceeds its Positive Experience Index score, which means that more people in Syria report feeling a lot of negative feelings than a lot of positive feelings such as enjoyment, feeling well-rested, and being treated with respect. People living in the Middle East and North Africa (MENA) region report the highest negative emotions in the world and have done so since Gallup began tracking this index in 2006. In 2013, the MENA region posted the highest regional score, at 44, in Gallup's history of tracking negative emotions worldwide. Although it does not make the top 10 list, another country contributing to the global rise in negative emotions is India, which is home to more than one-sixth of the world's population. 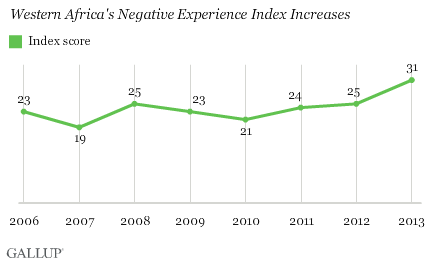 Since 2006, India's Negative Experience Index score has increased 11 points, rising from 20 to 31. Leading up to India's recent election, more Indians were pessimistic about several issues in their country, including the economy, the jobs situation, corruption, and personal safety. Western Africa's index score increased 10 points over the past four years, making it one of the highest regional scores in the world. In the Western Africa region, Sierra Leone has consistently reported high negative emotions, but over the past two years, this index score has increased by 12 points. Guinea (36), Nigeria (33), and Ivory Coast (32) also reported high Negative Experience Index scores. The most surprising score regionally -- also the lowest -- might be Mali (20), which had faced armed conflict from the Tuaregs since 2012 and looked to the French for military support. It is important to note, however, that the regions of Gao, Kidal, Mopti, and Tombouctou in Mali were excluded from the sampling because of heightened insecurity. These four regions represent 23% of the total population in Mali. Had they been included, the results might have been different. There are a number of indicators that highly relate to negative emotions, including poverty, job climate, freedom, and corruption. However, the one with the strongest relationship is long-term unemployment, as measured by the World Bank. 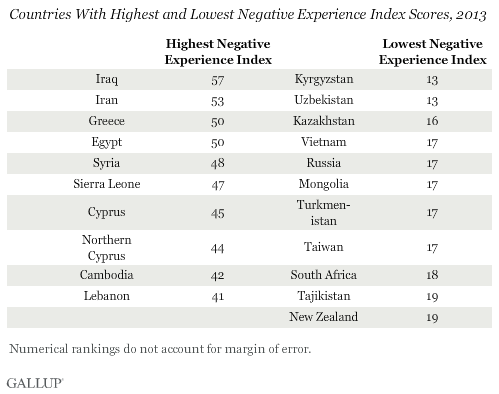 Several countries with high Negative Experience Index scores have straightforward explanations as to why so many residents are experiencing negative emotions in their country -- ranging from war in Syria to the financial collapse in Greece. Countries with less clear-cut reasons for high negative emotion scores can make their biggest improvements on the Negative Experience Index score by accelerating quality job growth in their countries.